This is now the Merch Thread, if you have any questions on Kaki's merchandise, ask here. Hey I bought this shirt last night at Kaki's gig at Brass Monkey in Cronulla, Australia. It's 1 size too small the shirt is what shes selling at her current gigs. Anyhoo I would like to offer it to a fan instead of an ebay'er. Its a size 8 Ladies top. or alternitivly I'll sell this for $30 australian dollars - use a currency converter. - I'm happy to post to anywhere. The new merch looks pretty sweet. I'm glad this thread was opened. I want to make my own kaki king shirt and submit it to this site where you get money if they choose to produce it. Is this legal though to produce a shirt with a band or artist and get paid for it without anyone's permission? You'd be making money off of her name. they had underpants made and it was printed on the wrong type of underpants and so they give it away if you buy 2/3 things or you can buy it for 10€. there is a video somewhere on youtube where kaki explains it. amanda.went.away wrote: Yeah, it's illegal. I see... I guess I'll just get one of them made just for me then. ^^ For the love of...DON'T forget the jacket!!!! 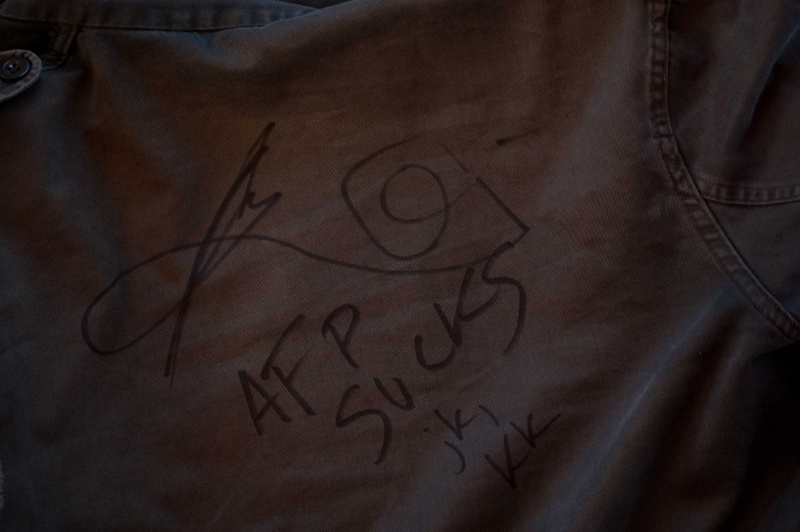 Please update on any AFP reaction to the awesomeness that is that epic piece of clothing! I'm excited to see her reaction! is a M size of these US shirts equal to ours European M? can you pay with paypall on this site?? i have no idea that they have paypal, most of the time if they have it you can see it on the site. just start ordering and if you can't use paypal delete your order or ask someone who does have visa to order it for you. i haven't ordered anything from that site, but most of the time it takes 7 to 14 days to get stuff from America or Canada to Belgium. i don't know where you are from. yeah, the volcano ash cloud sucked (concert was canceled). one of my orders took a longer time to get here than it usually does. the black t-shist (yellow name) is awesome, the green one not so impressive and the red with zip is wonderful but a little on the warm side. underwear pants are nice. yeah the sweater is a bit warm for this time of year but at least you know that you'll have an awesome sweater for the colder days.